The ABC, CBS and NBC evening newscasts on Friday all hyped the "dire" warning on global warming from the UN's "prestigious" Intergovernmental Panel on Climate Change (IPCC), with the CBS Evening News leading with two full stories. But ABC's Charles Gibson acknowledged "a bit of irony on the day global warming report was released," given "parts of the Northeast are digging out from April snow" as "temperatures could be 20 to 40 degrees below normal," making it "colder on Easter day than on Christmas day." NBC anchor Brian Williams followed up his newscast's global warming story with how "the problem isn't warming but what could be a record cold Easter weekend in parts of this country." CBS anchor Russ Mitchell didn't point out any contradiction with the hyperbolic stories on global warming as he described the current weather simply as "strange" since "a Spring freeze is on" in the Northeast. Mitchell teased his top story of the day: "Tonight, dire new predictions about disappearing species, melting glaciers, shrinking continents and more. Scientists say all the results of global warming." On Friday's Good Morning America, weatherman and liberal environmental activist Sam Champion hyped a new global warming study released on April 6. The ABC anchor also featured a representative from a left-wing environmental group and failed to identify the organization's political slant. Only minutes after reporting on the "arctic blast" of unusually cold temperatures that much of the country is facing, Champion touted a new report from the Intergovernmental Panel on Climate Change (IPCC) that noted "we're already facing earlier springs." A new report from the Pew Research Center for the People and the Press found the public has relatively little confidence in what the military and the media are telling them about the war in Iraq, although the press has less credibility than the Pentagon. Interestingly, a majority of self-described Democrats say they are putting their confidence in the media, while Republicans have generally opted to trust the military. Pew discovered that "fewer than a third of Republicans (29%) feel confident in what they are hearing from the press, while about half of Democrats (51%) remain confident in the news from Iraq." 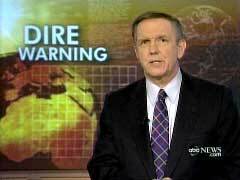 The ABC, CBS and NBC evening newscasts on Friday all hyped the "dire" warning on global warming from the UN's "prestigious" Intergovernmental Panel on Climate Change (IPCC), with the CBS Evening News leading with two full stories. But ABC's Charles Gibson acknowledged "a bit of irony on the day global warming report was released," given "parts of the Northeast are digging out from April snow" as "temperatures could be 20 to 40 degrees below normal," making it "colder on Easter day than on Christmas day." NBC anchor Brian Williams followed up his newscast's global warming story with how "the problem isn't warming but what could be a record cold Easter weekend in parts of this country." CBS anchor Russ Mitchell didn't point out any contradiction with the hyperbolic stories on global warming as he described the current weather simply as "strange" since "a Spring freeze is on" in the Northeast. Mitchell teased his top story of the day: "Tonight, dire new predictions about disappearing species, melting glaciers, shrinking continents and more. Scientists say all the results of global warming." 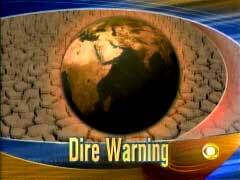 Over on ABC, Gibson echoed: "Dire warning. The world's top scientists issue a stark forecast of drought, crop failure and floods because of climate change." NBC's Williams hailed the "new report on global warming from a prestigious panel of scientists" who issued "blunt" findings: "Climate change is happening, it will lead to tremendous changes around the world that could have a very negative impact on the well-being of people, animals and entire ecosystems." # ABC's World News. Charles Gibson, after leading with the return home by the Brits held in Iran: "And the other major story today, a highly-anticipated report from the world's top scientists on the global warming. It is the clearest, most comprehensive statement yet on how industrial and motor vehicle emission are affecting the planet. It is a gloomy picture. And the report says in the immediate future, the effects of global warming can't be changed. Man just has to adapt. Which won't be easy." Gibson, after the story from Bill Blakemore: "A bit of irony on the day global warming report was released. Parts of the Northeast are digging out from April snow. Much of the East is in for a very cold Easter weekend. Temperatures could be 20 to 40 degrees below normal. Colder on Easter day than on Christmas day." # CBS Evening News. Fill-in anchor Russ Mitchell led: "Good evening, Katie is off tonight. We are beginning this evening with that dramatic changes that are coming to our world, at least according to scientists out tonight with their latest predictions. They say heat waves will cut food production and increase wildfires. By 2020 as many as 250 million more people could go thirsty and if average temperatures increase just two degrees, it could put 30 percent of the world's species at a greater risk of extinction." Mitchell, after reports from Mark Phillips and Jerry Bowen: "Strange weather is certainly on a lot of minds in the Northeast tonight where a Spring freeze is on. Up to a foot and a half of snow fell this week in parts of Maine and New Hampshire, bringing down trees and power lines. Utility crews are still working tonight to get power back. At one point, 180,000 homes and businesses were in the dark. And it was cold, relatively speaking, in paradise. The temperature in Hawaii yesterday got as low as 57 degrees. It was a record for that date. # NBC Nightly News. Brian Williams: "Now to a new report on global warming from a prestigious panel of scientists convened by the UN. The findings are blunt: Climate change is happening, it will lead to tremendous changes around the world that could have a very negative impact on the well-being of people, animals and entire ecosystems." Williams, after Anne Thompson's piece: "Now we should add for the near future, this weekend, the problem isn't warming but what could be a record cold Easter weekend in parts of this country, especially the South. Much of the nation feeling the grip of a cold weather system that has already led to the cancellation of two major league ball games and a snow delay for the Mariners-Indians game this afternoon. And, by the way, it's predicted to be freezing, 32 degrees at tee-off time at the Masters final round on Sunday in Augusta, Georgia." 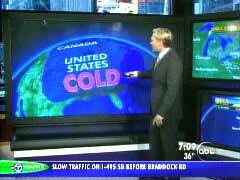 "But it's a shot of cold air and it's opened the door for arctic air all the way through the nation. Call it about two thirds of the nation getting this push of arctic cold. This is normally a December, mid-December pattern. As this cold air goes, look at the shades of blue in just about all areas." 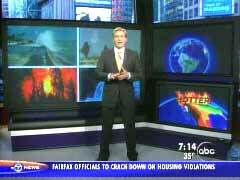 Diane Sawyer: "Well, I'm here with Sam this morning, because there's a brand new report out on global warming. And this one finally translates what all this means for humans." Sam Champion: "Yes. 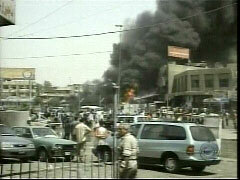 The second of four expected reports. 450 lead authors of the world's top scientists have been hammering it all night and the results, the results just came out hours ago. Baking droughts in America's west, more waging wildfires in places like California and Texas. And swamped eastern coast lines. That's the future of our world, today's report says, unless global warming is stopped." Brenda Ekwurzel, Union of Concerned Scientists: "The evidence is quite strong, and the time for action is now." Champion: "These scientists say we're already facing earlier springs and losing ice. If global temperatures continue to rise, things could get worse. A boost of just 1.6 degrees from present average temperatures could lead to the extinction of 30 percent of species worldwide. A rise of four degrees, over half the world's species could be lost. Already, America's west is feeling the effects. In the midst of a 10 year drought. Look at this, Nevada's lake Mead, a pier to nowhere. What was the lake is 80 feet below normal levels. Seven states draw their water from the dwindling Colorado River. As the water levels drop, officials are scrambling to take action before it's too late." Pat Mulroy, General Mgr, Las Vegas Valley Water District: "All of us in the Colorado River basin are headed for a much more conservative use of water." Champion: "$2.5 billion in billion in water projects are already under way, among them, a proposed 280 mile pipeline across parched Nevada." California Governor Arnold Schwarzenegger: "We are in desperate need." Champion: "Governor's Schwarzenegger is proposing bonds for new water storage in California as well. The question is, is any of this enough? And how can we stop it? Well, their third report which comes out in May will detail their ideas, these same scientists ideas, on how to stop global warming." During the piece, the ABC anchor allowed no dissenting opinions and didn't explain the financial cost to "stop global warming." In comparison, NBC's Today show didn't mention the new report at all. Over on CBS, Early Show, reporter Mark Phillips hosted a segment in the 7am hour that covered much of the same ground, but without any liberal activists masquerading as neutral observers. Chris Wragge: "Now to the latest report on global warming, and the news is not good. CBS News correspondent Mark Phillips is live in London with details this morning, Mark, good morning." Mark Phillips: "Chris, well the first U.N. report this year dealt with global warming and how it meant that things were going to get bad. The second report deals with where the worst of that bad would be. And because this report is so specific, it was also extremely political. In fact, finalizing the report which was years in the making, came down to an all-night session last night, described as very contentious." Rajendra Pachauri: "I am wearing the suit that I wore yesterday morning. And I've been sitting in a chair all night." Phillips: "Every line had to be agreed not only by an international panel of top climate scientists but by governments as well, and that was the problem. Particularly, it seems, the governments of the United States, China, and Saudi Arabia. But the major thrust of the report could not be watered down. It concludes that those who are already suffering most in this world are going to suffer worse due to global warming. Poor people in poor countries are going to be most affected as the climate warms in the next century. The already parched areas of sub Sahara Africa will get hotter, drier, and less able to support populations. And the low-lying areas of Asia, called the megadeltas, will be particularly vulnerable to sea level rise." Pachauri: "It's the poorest of the poor in the world who are going to be the worst hit." Phillips: "But the rich countries are not immune. The report warns of increased risks of brush fires in California, of insect infestations and of increased frequencies of heat waves in the American cities already prone to them. And the U.S. has its own low-lying areas in the southeast whose vulnerability will increase. And, so, the scientists have had their say. The question now is whether governments will buy into it. Global warming is an issue that is already moving away from science and into politics." While Democrats, Republicans and independents all express less confidence in the information they are receiving about Iraq today, there is now a substantial partisan divide in how these two institutions are viewed. The vast majority of Republicans (73%) remain at least somewhat confident in the military's portrayal of how the war is going, compared with just 32% of Democrats. At the outset of the war, the partisan gap was far less pronounced. Conversely, Republican confidence in the accuracy of media reports on the war has declined more sharply. In March 2003, eight-in-ten Americans generally trusted press reports and opinions did not differ across party lines. Today, fewer than a third of Republicans (29%) feel confident in what they are hearing from the press, while about half of Democrats (51%) remain confident in the news from Iraq. Independents have become skeptical of the information they are getting from both institutions. The share of independents who express at least a fair amount of confidence in military portrayals of the war is down from 83% to 39% since the start of the war, and their confidence in the accuracy of press reports has declined from 81% to 34%.